With qualified activation on Verizon, AT&T and Sprint. Free Select Xbox One Wireless Controller with purchase. Sanus - Premium Series Advanced Tilt TV Wall Mount For Most 42" - 90" TVs - Extends 5.75"
Buy One Google Chromecast For $25. Buy Two For $45. Shop Black Friday Deals on OLED TVs. Shop Black Friday Deals on Samsung QLED TVs. Free Vault Boy keychain with purchase. Free Collapsible Cup with purchase. iPhone 7. Starting at $9.99/mo. iPhone 6S on SIMPLE Mobile and Total Wireless. With qualified activation on Verizon. LG G7 ThinQ Starting at $7/mo. With qualified activation on Sprint. Get $10 in My Best Buy Rewards with purchase. With purchase of an Amazon Echo product. Free Samsung POWERbot Vacuum with purchase of 2 or more major appliances totaling $2,999 and up. 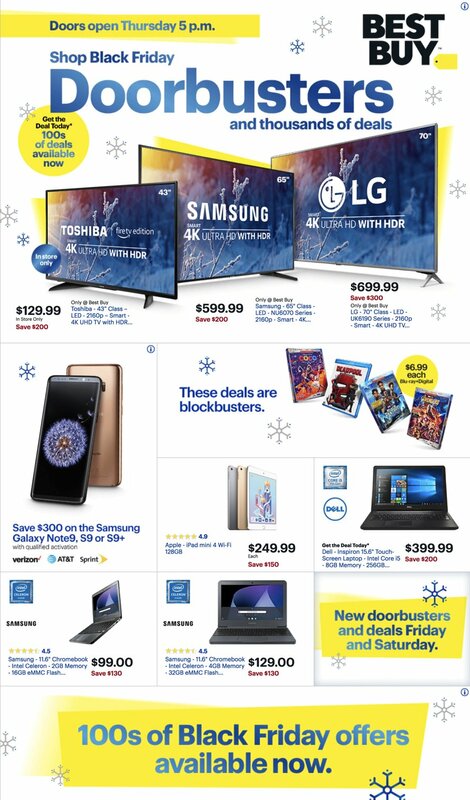 On November 23, Best Buy’s Black Friday sale event will offer in-store and online deals on this year’s top electronics. Shop a wide range of categories, including the newest smartphones, laptops, video games, smart home gadgets, VR gear, and cameras. TVs were a top sale last year with savings of up to 64% on 4K big screens. In addition to brands such as Samsung, Microsoft, Sony, Nikon, and Bose, Best Buy’s Apple event will have deals on iPhones, iPads, and iMacs. See our Best Buy store page for more coupons and promo codes.